China is a country that suits all types of traveller. Whether you want a luxury holiday, a foodie trip, a backpacking adventure or want to explore the vast jungles and forests – the size of the country allows a wide variety of experiences. This country has long fascinated outsiders. With its deeply rich spiritual and mystical history, China has a strong connection to its arts, music, customs and traditions and, of course, food. One of the many tourist destinations, Beijing, is a blueprint for the 21st century metropolis. It is a place where you can dance ‘til dawn, feast on mind-blowing cuisine, visit Buddhist temples and relax in panda gardens. China’s tourism industry has flourished over the past few decades. More and more people are choosing China holidays, making it now the fourth most visited country in the world, behind Spain, the U.S. and France. The World Trade Organisation estimates that by 2020, China will be rank number one. Destination2.co.uk runs China packages from the UK throughout the year. 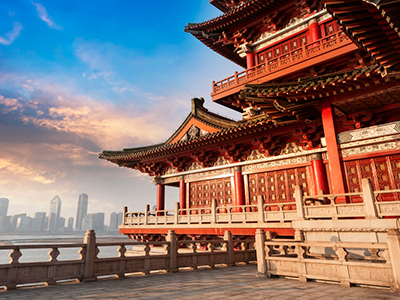 If you’re interested in visiting this fascinating country, browse our selection of discounted luxury holidays to China, and find out why millions of tourists keep returning to the Red Dragon. China has every type of landscape possible – from snow-capped mountains, vast deserts, thriving conurbations, endless stretches of beach, rolling hills and rainforests. Beijing is situated in northern China and is the most populated capital city in the world. Its influence on maths, architecture, sports, politics, music, fashion, technology and business has been felt all over the world – and the city itself is a celebration of the old and new. A walk around this incredible city will reveal countless temples, parks, gardens, tombs and palaces. It is home to seven UNESCO World Heritage sites, the Forbidden City, Temple of Heaven, Summer Palace, Ming Tombs, Zhoukoudian – as well as parts of the Great Wall and the Grand Canal. And you won’t be able to go anywhere without being tempted by the endless supply of delicious cuisine. When you tire of incredible feasts, there’s so much more to do on your trip to China. With festivals occurring throughout the year, cruises along the Yangtze River, thrilling train rides across country and undiscovered beauty spots – this is a place where adventure lurks around every corner. China has very warm summers – which are considered peak time for tourism. However, spring and autumn are also great times to visit the country – with spring blooms waking up Beijing from winter, and the months from September to November being considered the nicest time of year to visit. Winter can often bring snow, and is usually bright but cold. If you want to experience life in one of the most enigmatic countries in the world, enjoy the finest foods and visit some of the most beautiful shrines and temples ever created – China is a must. This country is for adventurers, wanderers, explorers, gastronomes and anyone interested in the fascinating history of one of the world’s emerging superpowers.